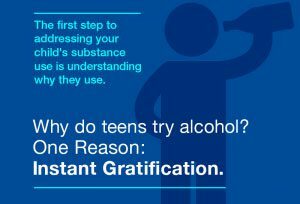 It’s important that you, as a parent, understand these reasons and talk to your kids about the dangers of drinking and doing drugs. Teenagers see lots of people consuming various substances. They see their parents and other adults drinking alcohol, smoking cigarettes and, sometimes, trying other substances. Also, a teenager’s social scene often revolves around drinking and smoking marijuana. Sometimes friends urge one another to have a drink or smoke pot, but it’s just as common for teens to start trying a substance because it’s readily available and they see all their friends enjoying it. In their minds, they see drug use as a part of the normal teenage experience. Forty-five percent of teens agree with the statement: “The music that teens listen to makes marijuana seem cool.” And 45 percent of teens agree with the statement “Movies and TV shows make drugs seem like an ok thing to do.” (PATS 2012) So be aware of the media that your son or daughter is consuming and talk to them about it. When teens are unhappy and can’t find a healthy outlet for their frustration or a trusted confidant, they may turn to chemicals for solace. Depending on what substance they’re trying, they may feel blissfully oblivious, wonderfully happy or energized and confident. The often rough teenage years can take an emotional toll on children, sometimes even causing depression, so when teens are given a chance to take something to make them feel better, many can’t resist. For example, some teens abuse prescription medicine to manage stress or regulate their lives. Sometimes they abuse prescription stimulants (used to treat attention deficit hyperactivity disorder) to provide additional energy and the ability to focus when they’re studying or taking tests. Others are abusing prescription pain relievers and tranquilizers to cope with academic, social or emotional stress. Teens who can’t tolerate being alone have trouble keeping themselves occupied or crave excitement are prime candidates for substance use. Not only do alcohol and marijuana give them something to do, but those substances help fill the internal void they feel. Further, they provide a common ground for interacting with like-minded teens, a way to instantly bond with a group of kids. Different rebellious teens choose different substances to use based on their personalities. Alcohol is the drug of choice for the angry teenager because it frees him to behave aggressively. Methamphetamine, or meth, also encourages aggressive, violent behavior, and can be far more dangerous and potent than alcohol. Marijuana, on the other hand, often seems to reduce aggression and is more of an avoidance drug. Some teens abuse prescription medicine to party and get high. LSD and hallucinogens are also escape drugs, often used by young people who feel misunderstood and may long to escape to a more idealistic, kind world. Smoking cigarettes can be a form of rebellion to flaunt their independence and make their parents angry. The reasons for teenage drug-use are as complex as teenagers themselves. Many shy teenagers who lack confidence report that they’ll do things under the influence of alcohol or drugs that they might not otherwise. This is part of the appeal of drugs and alcohol even for relatively self-confident teens; you have the courage to dance if you’re a bad dancer, or sing at the top of your lungs even if you have a terrible voice, or kiss the girl you’re attracted to. And alcohol and other drugs tend not only to loosen your inhibitions but to alleviate social anxiety. Not only do you have something in common with the other people around you, but there’s the mentality that if you do anything or say anything stupid, everyone will just think you had too many drinks or smoked too much weed. 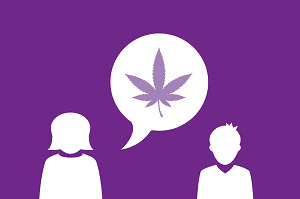 Find out how to have meaningful, productive conversations with your teen about marijuana — download our free marijuana talk kit to help you answer those tough questions. Are you feeling overwhelmed or have a question about your child’s drug or alcohol use, and need to talk to someone? Get one-on-one help. Alcohol is the most widely used substance of abuse among America’s young people and poses enormous health and safety risks. Here’s what you should know about underage drinking. Find out how you can model healthy behaviors for your teen or young adult. We are grateful to Dr. Neil I. Bernstein for his help preparing this article and for sharing his insights from his book How to Keep Your Teenager Out of Trouble and What to Do if You Can’t.